This quick and easy recipe is sure to be a hit with the kids and is a great way to sneak some veggies into them. It's hard to believe that Pumpkin Week is nearly over. I am back today with a savory recipe that is sure to become one of your favorite go to meals. Before we talk anymore about that though, if you haven't yet entered the amazing giveaway provided by our sponsors, head on over to my Welcome Post and do so right now! Our hosts, Terri of Love and Confections and Christie of A Kitchen Hoor's Adventures have done a spectacular job of locating sponsors who not only provide the bloggers with great products but offer our readers the opportunity to win some great prizes. Now back to this recipe. You can make this in the morning or the night before and leave it in the slow cooker all day if you want. I would probably only do that if I was making it for a crowd and doubling or tripling the recipe. I only prepared 4 servings for our family so I just made it on the stove top. Dinner was still on the table in a little more than an hour's time. I hope that you are all enjoying Pumpkin Week as much as I. Each day I anxiously head over to the other blogger's websites to see what they are sharing. Why don't you join me today? Welcome back.....weren't those some terrific ideas for celebrating Fall? I cannot wait to try some of them. 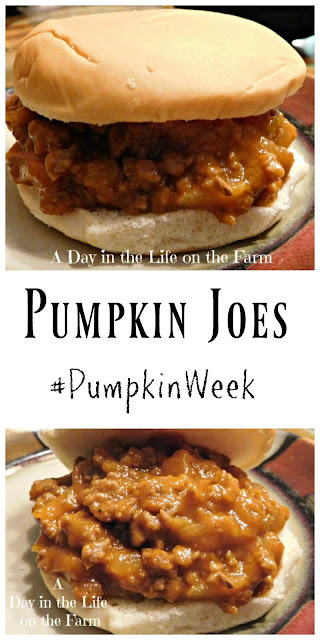 Please give my Pumpkin Joes a taste and let me know what you think. Place the beef and onions in a large skillet over med high heat. Season with salt and pepper and cook, breaking up the meat and stirring, until the beef is browned and crumbly and the onions are tender. Drain fat from pan, if necessary. Stir in the jelly, pumpkin and tomato soup. Bring to a boil, reduce heat and simmer for an 45 minutes to an hour, until flavors have melded and the mixture has thickened. Divide the mixture among 4 hamburger buns and serve. My older son LOVES Sloppy Joe's though he could never remember what they were called and called them 'Messy Jacks' once and it stuck. We'll make Pumpkin Jacks soon. LOL. I love when that happens. We still call our favorite Mexican restaurant Junes after our youngest daughter asked to go to Junes when she wanted Juans LOL. What a delicious way to use up any leftover pumpkin puree! 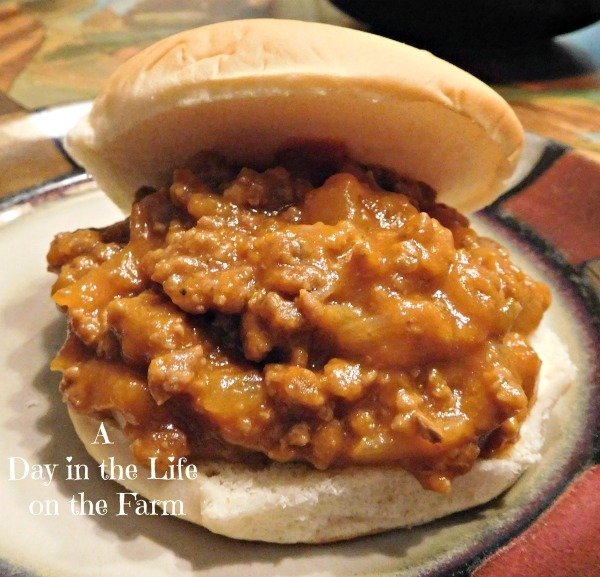 Sloppy Joes are one recipe I've hardly ever made. I still think of them as part of the elementary school cafeteria food I had as a child. I should get over it. This might be a good starting point! I love Sloppy Joes. 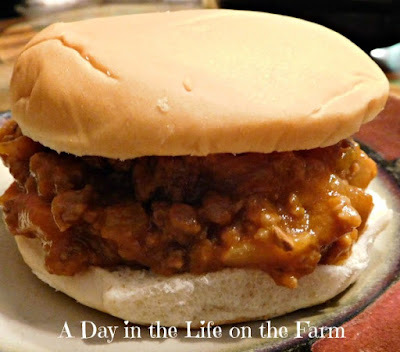 I don't love the Manwich things that people pass off as sloppy joes but I do love the homemade burgers and sauce on a bun.